Made of 100% cotton, this mask is soft and absorbent, containing lots of milk like essence to bring it into your skin. 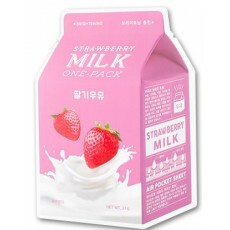 It contains milk extract that softens and hydrates your skin and strawberry extract which is rich in Vitamin C and other minerals that nourish your skin for a brighter and clearer complexion. After cleansing and toning, open pouch and apply sheetmask to your face. Leave it for 15-20 minutes. Remove and pat in remaining essences to your face, or to other parts of your body like neck, arms or legs.